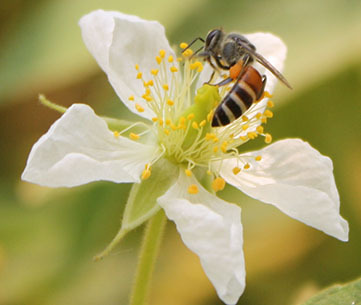 Dwarf honey bees are by far the most common honey bees throughout tropical Asia. The most common of the dwarf honey bees, is the Red dwarf honey bee (Apis florea) which is naturally distributed from the Indian subcontinent throughout south-east Asia through to the Malaysian peninsular. 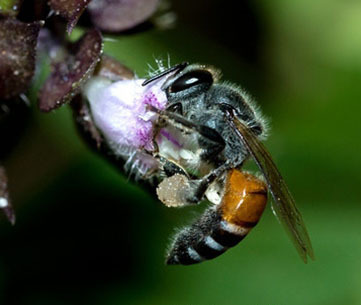 Another dwarf honey bee species, the Black dwarf honey bee (Apis andreniformis), is less common but is still widely distributed from the Philippines, to China and Myanmar. Both species overlap in south-east Asia. Both species of dwarf honey bee look very similar. 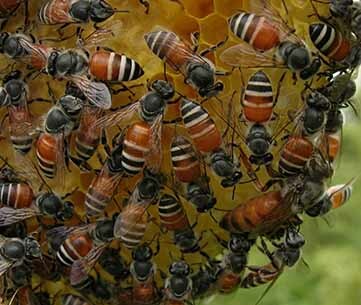 The Red dwarf honey bee is red-brown and has quite distinct red/brown and white and black bands on the abdomen. 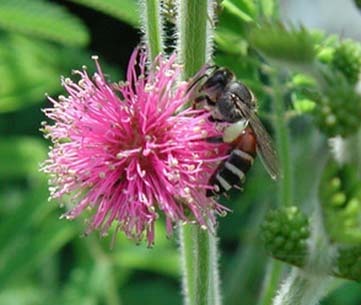 A foraging worker bee body length is 7–10 mm, while the forewing length is between 6.0–6.9 mm. The Black dwarf honey bee is roughly the same size, but is blacker in colour, as the name suggests. Their nesting biology is also very similar. 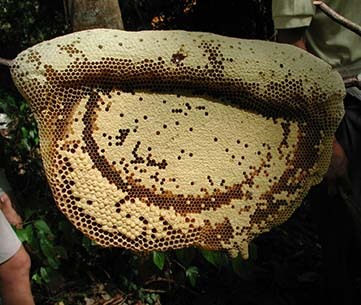 Dwarf honey bees are characterised by their external nesting habits and their single comb. Dwarf honey bee nests consist of a small single comb (usually less than 25 cm across) nest that is built around a small branch. This small nest contains a crown above the branch for honey storage, as well as being used by the bees as a platform for the foragers leaving and arriving at the nest. 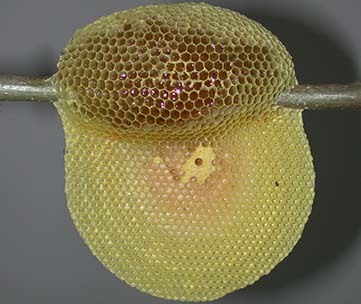 The brood comb is suspended below the supporting branch in a single comb. The curtain of bees for a large dwarf honey bee colony is usually 3–4 bees thick. On either side of the nest on the branch, the honey bees commonly place a propolis barrier on the branch which acts as a sticky and repellent barrier to protect the nest from attack by other insects, such as ants. Given that dwarf honey bee colonies are usually very small (usually only a few thousand bees), and that they only produce a single comb with very little honey, dwarf honey bees have not been domesticated for honey production or pollination services. 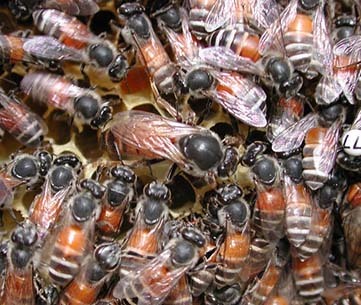 Apart from their small size and simple single comb exposed nests, much of their life cycle, biology and behaviour is similar to that of other Apis species. Dwarf honey bees typically establish their colonies in cryptic nest sites, and due to the fact that they are not very aggressive, they can easily stay undetected for a long time. 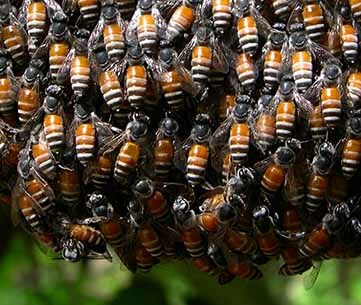 It is believed that this behavioural trait has assisted in the spread and expansion of the Red dwarf honey bee throughout the Middle East and into eastern Africa. The Red dwarf honey bee is now widely present in the Middle East, including Iran, Iraq, Israel, Jordan, Yemen, and Saudi Arabia as well as in Sudan in eastern Africa where populations of Red dwarf honey bee have been accidentally introduced. Reports from these areas suggest that the Red dwarf honey bee is continually expanding westward in an invasive manner and has even started to rob European honey bee hives, even in areas where there are dense populations of European honey bees. One of the major risks for Australia if dwarf honey bees were to enter the country is the exotic parasitic mites that a nest may carry. Both the Red dwarf honey bee and the Black dwarf honey bee are parasitised by Euvarroa wongsirii and Euvarroa sinhai, both of which are close relatives to the deadly Varroa mites. Some research has been conducted on the ability of Euvarroa to parasitise European honey bees (A. mellifera) and survive on European honey bee adults, however, research into this area is very limited, and the scenario of Euvarroa parasitising European honey bees is considered highly unlikely. The ability of Euvarroa to parasitise European honey bees in the natural environment of Asia, where the native dwarf honey bees exist with the introduced European honey bees, has not been observed or reported to date. Despite dwarf honey bees being parasitised by these mites, reports suggest that they cause minimal impact for dwarf honey bee colonies as they are restricted to reproducing on drone brood. In addition to the Euvarroa mites, Tropilaelaps mites (Tropilaelaps clareae) have been observed on Red dwarf honey bee colonies. Tropilaelaps mite is capable of jumping over to European honey bee colonies. Parasitic mites such as these pose a constant threat to Australia’s honey bee population. Dwarf honey bees, and parasitic mites such as Euvarroa and Tropilaelaps species are currently not present in Australia and there are strict quarantine requirements in place to protect the Australian honey bee industry. Surveillance programs, such as the National Bee Pest Surveillance Program, are also in place in high risk ports to detect these pests if they do enter Australia so there will be a better chance of eradicating them. If you think you have seen dwarf honey bees or parasitic mites in your honey bee colony, call your local department of agriculture or the Exotic Plant Pest Hotline on 1800 084 881.